This list of super foods plays off a term made famous in a book called Superfoods, by Dr. Steven Pratt. Since then, I have found several doctors with their own version of the list, including Dr. Nicholas Perricone, Dr. Ann Kulze, and Dr. Shirley Perryman, to name a few. In my list, I combine their lists and information together and remove a few non-vegan items to create a vegan list. This list of super foods is great for your health as each helps prevent diseases, and although none can be considered to be a cure-all, if you can get some of these in your already healthy plant-based diet, you are going to improve your health. Super foods are those fruits, vegetables, whole grains and beans that pack a punch of phytonutrients (natural chemicals that are produced by plants) that protect your body against illnesses. Now, you can't expect to eat tons of junk food with a few blueberries on top and still be healthy. Also, you do still need to get enough exercise, water, and sunshine in order to be truly healthy. Some of the super foods on here are also high in calories and although I'm not a fan of counting calories, you will not want to overeat on them. However, if you have a reasonably healthy lifestyle and can add only a few from the list of super foods to your diet, that is better than nothing. The more you can add in from the list of super foods, the better, but sometimes it's easier to add a little bit at a time. Açaí berries come from the Amazon and have recently gained a lot of popularity. They have tons of antioxidants, monounsaturated fats that help lower cholesterol and improve digestion, and are a complete protein because they have all the amino acids. Açaí is also a great anti-inflammatory agent. The best form that you can get in the United States is the frozen pulp of the berry as the whole berry cannot travel from Brazil. Sprouts have tons of protein and vitamin C and are high in enzymes, which make them very easy to digest. Alfalfa sprouts are a top provider of D-glucaric acid, which fights cancer. They also have tons of saponins, which lower cholesterol levels by cleansing the system of cholesterol. The chlorophyll in alfalfa works with the good bacteria in your digestive system and aids in reduction of gas. Never a bad thing for a vegan! Avocados have the most folate, potassium, vitamin E, and magnesium of any fruit. They are full of fiber and monounsaturated fat, which lowers cholesterol, and is healthful for your heart. Read the full benefits of avocados here. 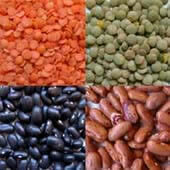 Beans and lentils have tons of fiber, potassium, and protein and some omega-6 fatty acids. They help prevent diabetes, reduce blood pressure and the risk of stroke, and they also protect the heart against disease. They are also anti-inflammatory agents and can prevent birth defects, as well as reduce obesity. Confused about how to cook beans? Check out my guide to soaking and cooking beans and legumes. Blueberries are high in potassium, vitamin C, antioxidants, and phytoflavinoids, and have been found to lower your risk for heart disease and cancer. They are also found to reduce inflammation, which dramatically aids in disease prevention. Choose the darkest blueberries you can find, as they have the most antioxidants. Read more about the benefits of blueberries. Broccoli is full of vitamins A and C, folate, and sulforaphane, which fights the production of cancer cells. It has also been found to reduce the risk of cataracts and birth defects, boost the immune system, build bones, and reduce the risk of cataracts. Learn more about the health benefits of eating broccoli. Buckwheat is a great super food that acts like a grain, so it's easy to use in your diet. It is very high in vitamins and minerals, has great monounsaturated fats, has soluble and insoluble fiber, and flavonoids that promote heart health. It is high in antioxidants which help increase blood circulation and decrease blood pressure. Dark chocolate has many antioxidants and flavonoids, which helps improve blood flow and lower blood pressure. You should try to find brands with 70%+ cocoa, and make sure to look out for those with milk fat. Cranberries are full of antioxidants from anthocyanin. They have a strong concentration of tannins which promote urinary tract health by attaching to bacteria in the bladder and preventing the bacteria from sticking to the walls, which is how infections form. They might be able to prevent other infections as well, such as tooth decay, salmonella, and staff infections. They are also being tested for their ability to reduce the risk of breast cancer. Flax seeds are super foods that are rich in omega 3 fatty acids, which lowers your risk for heart disease, reduces arthritis, and reduces memory loss and risk for Alzheimer's. Flax seeds are also high in monounsaturated fat, which lowers cholesterol levels. Garlic lowers cholesterol and blood pressure, and reduces risk of blood clots, cancers, Alzheimer's, and atherosclerosis. It also helps to fight infections and detoxifies the body. More information on the benefits of garlic. Oats are well known for their ability to reduce the risk of coronary heart disease, but they also reduce the risk of type II diabetes, lowering blood sugar levels, and reducing blood cholesterol levels. They are high in fiber and protein, as well as many phytonutrients. Oranges are full of vitamin C, which protects against colds and damage from free radicals. It also has flavonoids that lower high blood pressure and cholesterol, preventing strokes and heart disease, diabetes, cancer, and eye problems. Pomegranates are super foods that are full of antioxidants, and have been found to reduce bad cholesterol levels, increase blood flow, and might protect against cancer. Pumpkin is high in fiber and has tons of vitamins and minerals that fight diseases such as beta-carotene and alpha-carotene. Those carotenoids are what give pumpkin their color, and they protect the plant from sun damage, just like they do for our skin. They decrease the risk of many cancers, heart disease, and eye diseases. Read my full article on the benefits of pumpkin. Raspberries are a top antioxidant, are full of fiber, vitamin C, and have ellagic acid, which is found to fight cancer cell development. Soy is high in polyunsaturated fat, which lowers cholesterol, and helps make your heart healthy. A study found that a diet full of soy, oats, barley, almonds, and plant margarine lowers cholesterol as much as the leading cholesterol medicine in the marketplace. Excess soy can trigger breast cancer (read more about the soy controversy), so if you have it in your family history, do not eat too much soy. Also, look for whole soy products, like tofu, tempeh, and edamame. Read more about the benefits of soybeans and decide for yourself how much to add into your diet. 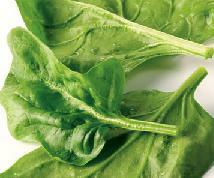 Spinach is a serious super food- it has several carotenoids, antioxidants, vitamin K, and B vitamins. It's know to decrease the risk of cardiovascular disease, several cancers, and eye problems like macular degeneration and cataracts. Sweet potatoes have more beta carotene than any other vegetable, and have tons of vitamin E and other vitamins, and are full of phytochemicals. They have been found to boost the immune system and fight cancer cells. Black, green, and white tea helps reduce your risk of heart disease, diabetes, and cancer. Black and green teas are antioxidants, and green has a special antioxidant called ECGC. ECGC has been shown to inhibit the growth of cancer, and it's been found that Japanese people who drink tea have lower cholesterol levels than those who do not. Tea has also been found to prevent osteoporosis. One thing to know is that tea loses some of its antioxidants and anti-inflammatory properties when it is bottled or decaffeinated. It's better to brew your own so you can control the added sugar, and so the healthful properties remain intact. They have a large amount of lycopene, which is the carotenoid that makes tomatoes red. It is an antioxidant and protects the body from damage, like many cancers and heart disease, among others. Lycopene also raises the skin's sun protection factor. The interesting thing is that there tends to be a higher concentration of lycopene in cooked tomatoes, and the body is better able to absorb the vitamins once cooked, and even more so if cooked with a little oil. Read more about the benefits of tomatoes. One of the more famous from the list of super foods, walnuts protect against coronary heart disease, diabetes, and cancer by lowering LDL cholesterol levels. They are high in protein and unsaturated fat, and actually help to lower cholesterol with their plant sterols. They are high in calories, so you only really need about a handful of them anywhere from 2-5 times per week. More in-depth information about the benefits of walnuts. Watercress is one of my favorite vegetables on the list of super foods, and has a good amount of vitamins A and C, and has isothiocyanates, which fights lung and esophageal cancer. Wheat germ has great protein, fiber, folate, and vitamin E, and is a great source of omega-3 fatty acids. It helps reduce cholesterol levels with its phytosterols. Eating from this list of super foods will make you feel healthier overall. Again, you might not be able to eat ALL of this list of super foods every day, or even every week. The easiest thing to do is start adding a few from this list of super foods at a time, get comfortable with them, and then add others off the list of super foods. Remember, it takes about three weeks to make a habit, so start now, and within a month your diet will be significantly healthier.